El Día de Muertos or Day of the dead is becoming more and more popular in the US. 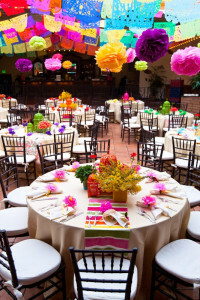 It has been celebrated in Mexico since the 1400s and even though we think of death as something bleak and dark, this holiday celebrates life and has some vivid and colorful decorations. 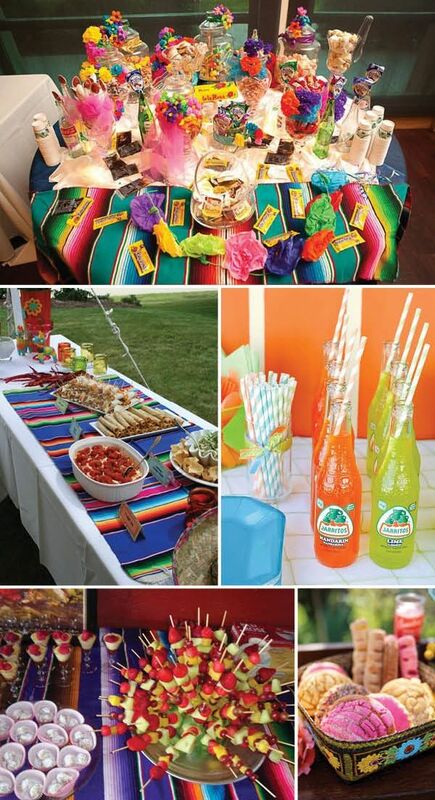 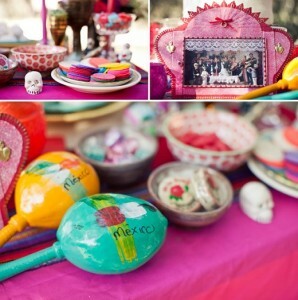 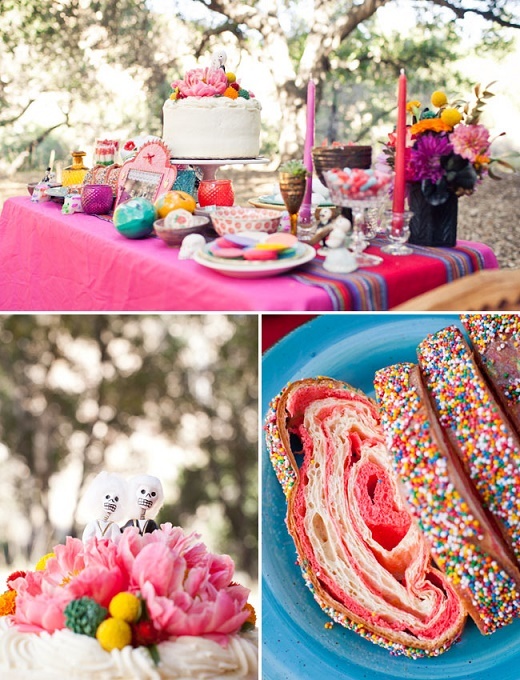 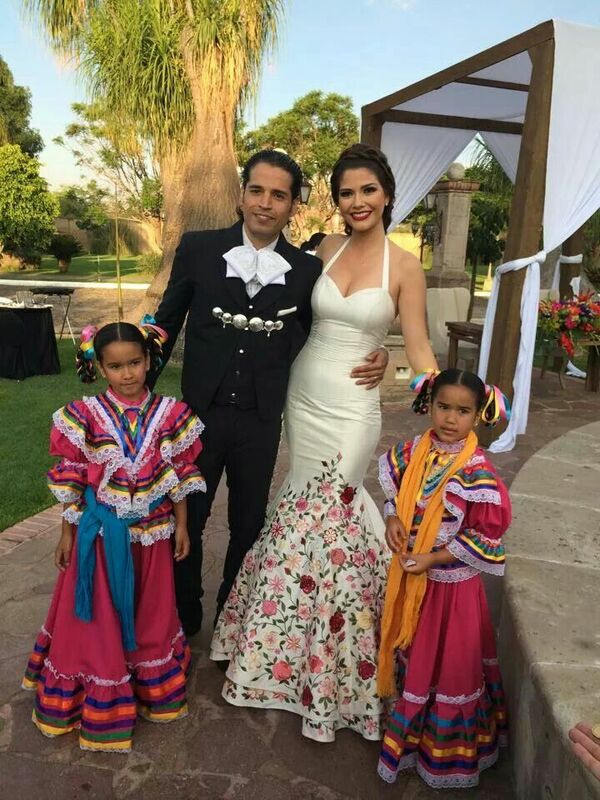 A Día de Muertos theme can add a magical and colorful feel to any wedding for a unique Mexican celebration. 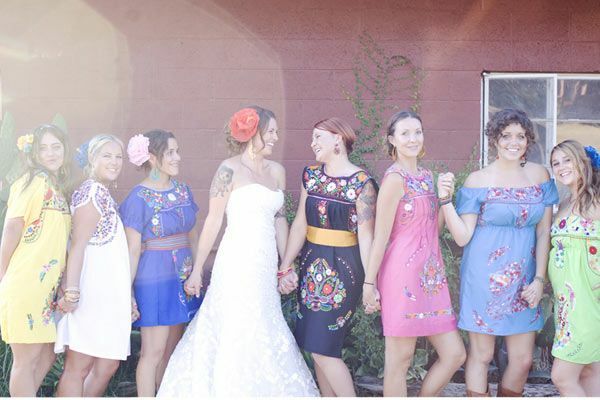 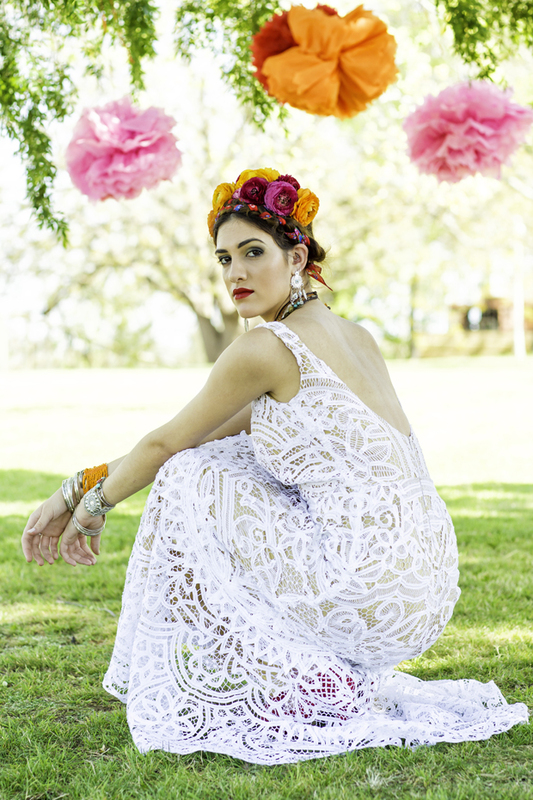 A”Frida Kahlo” vintage lace sleeveless, long sleeve, or off the shoulder dress will add the theme perfectly and a embroidered shawl is the ideal accessory for a Dia de Muertos wedding. Your make-up and hair do should be bright and a floral headpiece is the final touch to complete your wedding look. You will find these dresses via lostinparis.com.au , left dress style name is Bon Vivant (Vintage Battenburg lace dress) and right dress’ style name is Bohemian Beauty (Vintage lace wedding dress). 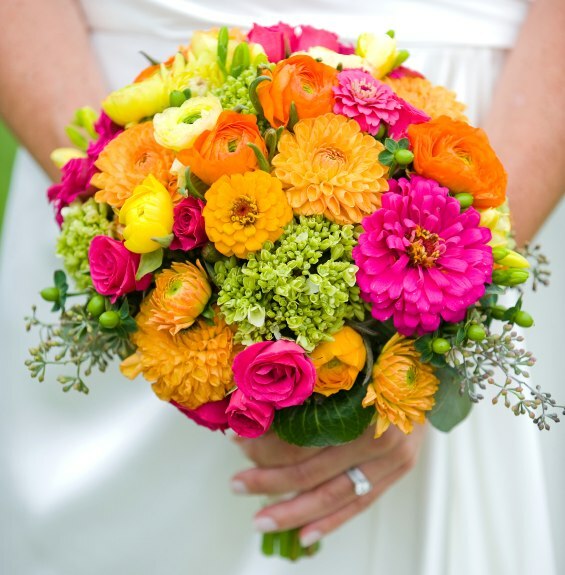 Marigold flowers are the traditional flowers used on the Day of the Dead, so create vivid floral arrangements for your centerpieces with this colorful flower, for your bouquet mix marigold with fuchsia, yellow, and green blooms. 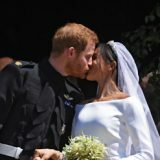 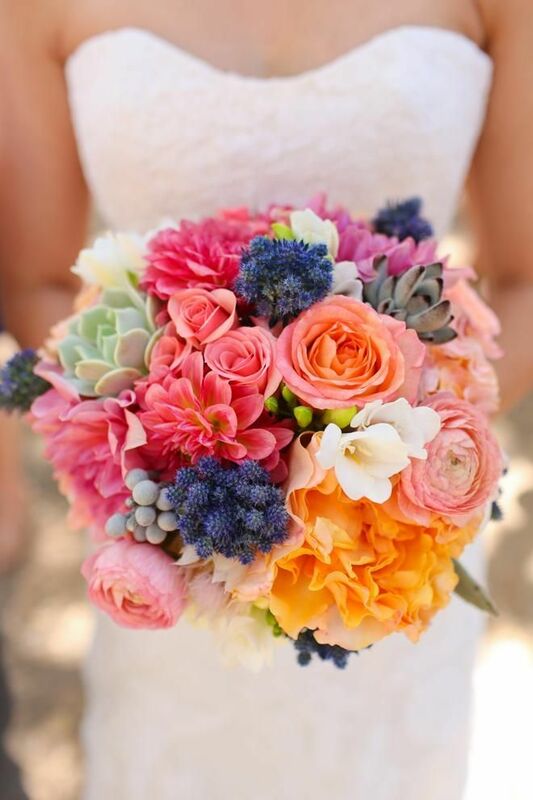 Bouquet via Alexan Events. 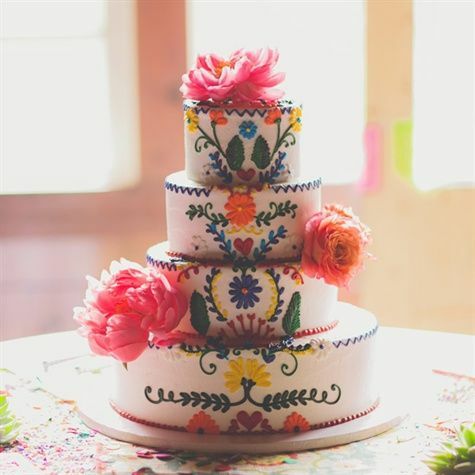 There is nothing like a stand out cake with Mexican style motifs and skull cake toppers, you can also include the marigold flower as an addition to the decoration and to tie in the floral arrangements. 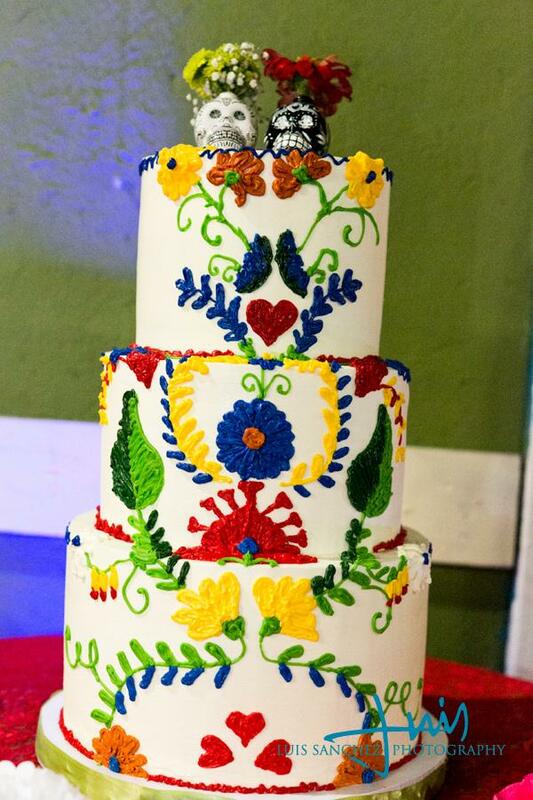 Folklorico meets Day of the Dead decorations on this cake via Luis Sanchez Photography. 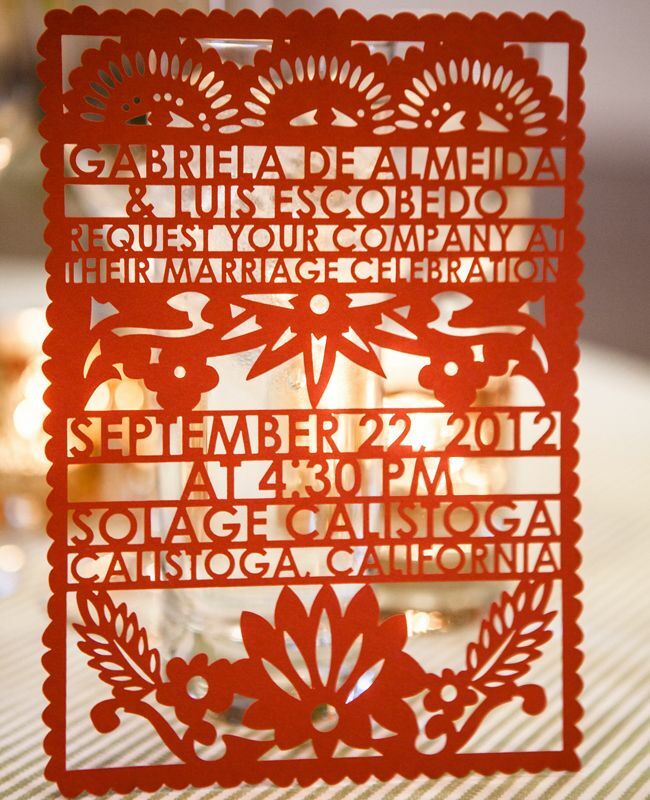 A laser cut invitation to mimic papel picado is perfect for the Dia de Muertos theme, you can have it printed on or have it actually laser cut, red is the most popular color but you can also go with the marigold color to tie everything in at your wedding. 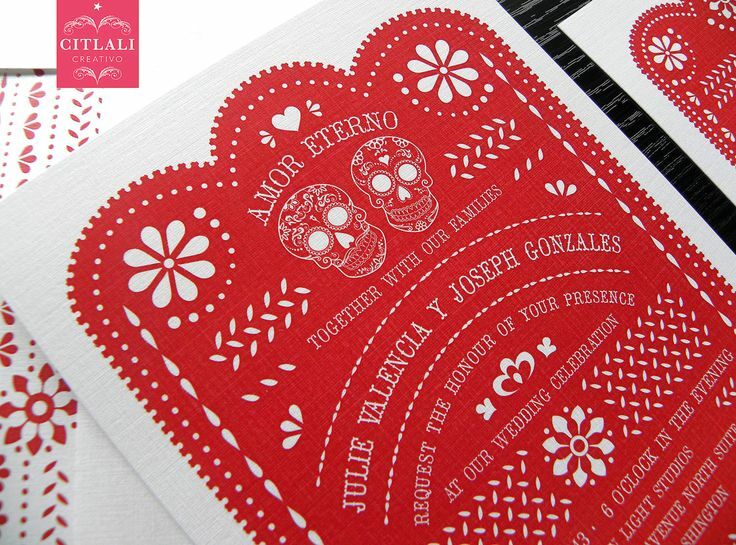 Add sugar candy skull images on invitation like this invitation from Citlali Creativo. 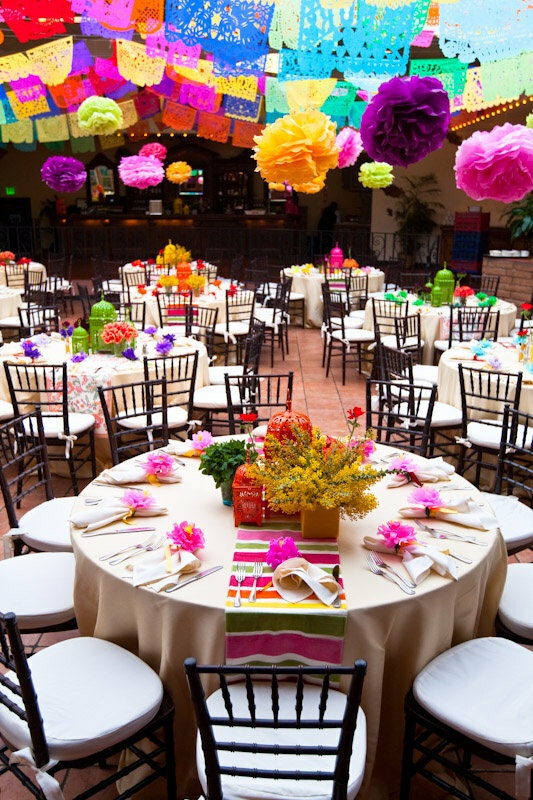 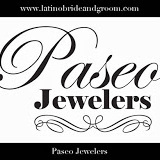 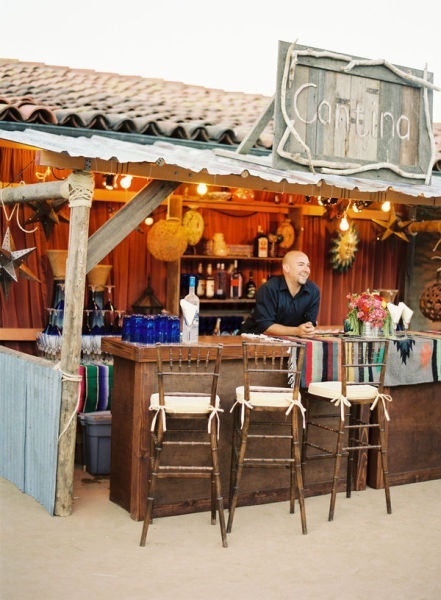 An outdoor venue is great so that you can hang papel picado banners throughout your wedding venue, indoors can work as well by hanging them by the chandeliers. 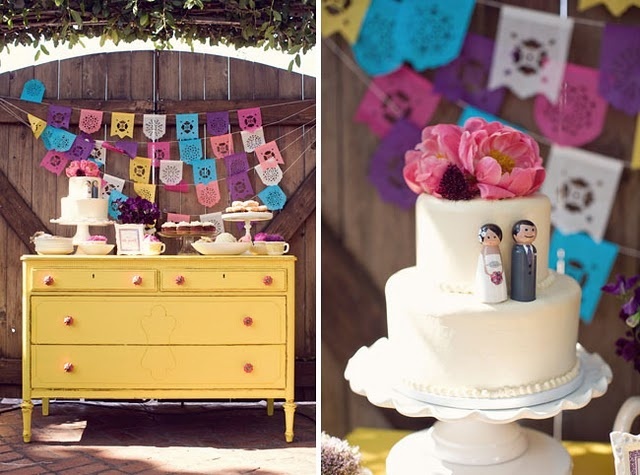 Add paper flowers with the banners and on your table just like this image here, Papel Picado banners found via etsy.com. 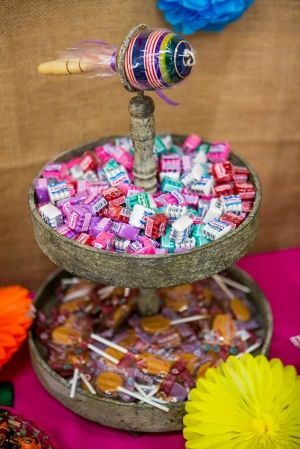 Small maracas, Mexican candy, and don’t forget pictures of your loved ones that have passed, and you want to remember and include them in your celebration. 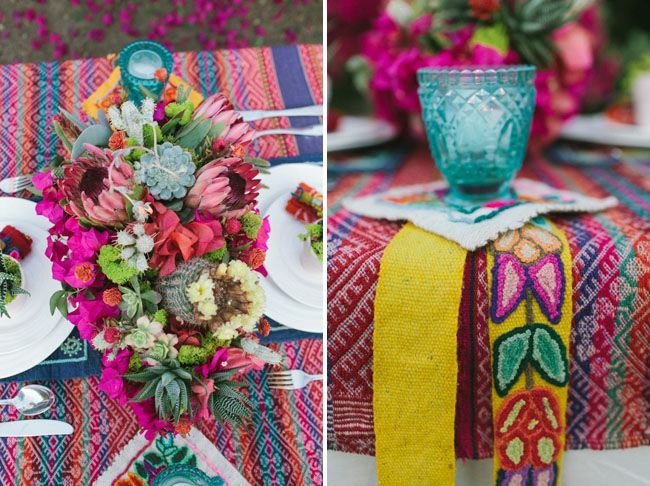 Primary Petals and The Vintage Table Co, did a tremendous photo shoot with a Dia de los Muertos wedding theme featured here, via Green Wedding Shoes. 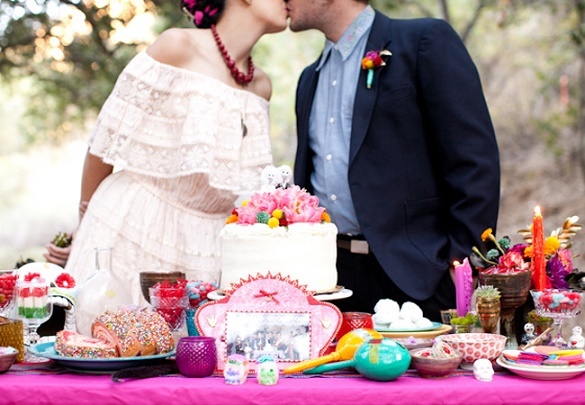 You must have your cake but also include pan dulce and the sugar skull candy that is traditionally used on Dia de Muertos, these will add more color than anything, plus the deliciousness of Mexican dessert! 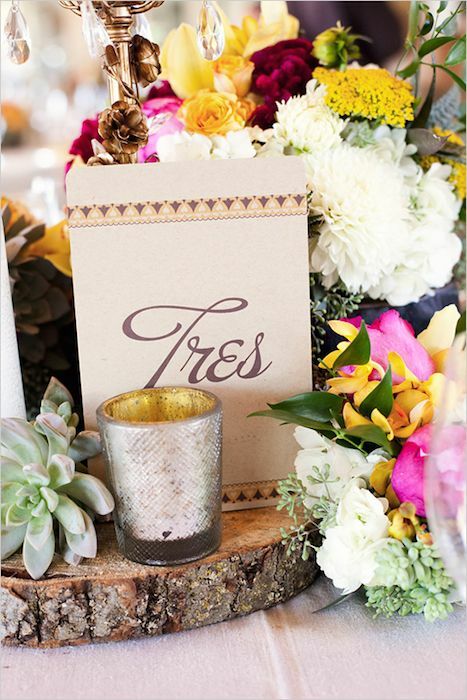 Image from photo shoot of Primary Petals and The Vintage Table Co, via Green Wedding Shoes. You must not forget your drinks in this wonderful Dia de Muertos theme, Hob Nob has Limited Edition wines in Wicked Red Blend, a blend of Grenache, Cabernet Sauvignon, Syrah, and Pinot Noir grapes that were harvested at the optimal time in the region of Languedoc in the South of France and Wicked Chardonnay, a blend of rich almond, hazelnut and honey aromas harvested at the optimal time in the Central Valley of California. 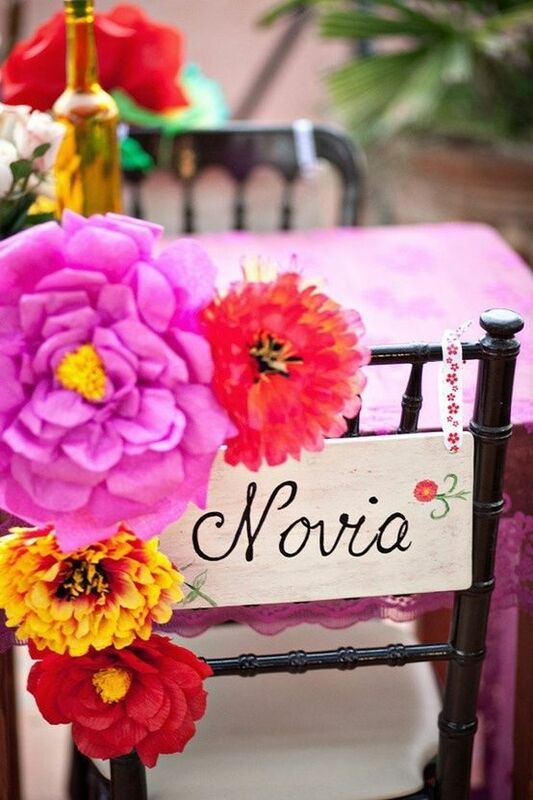 Via hobnobwines.com.